Njfindaride.org is an online directory of accessible transportation options for people with disabilities and others in New Jersey who don't have easy, reliable access to private automobile transportation. This website provides users with a way to search for accessible transportation and also gives those who are willing to provide rides a way to publicize information about their services. 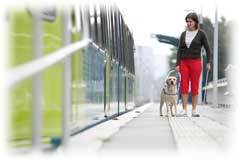 The site seeks to educate visitors about the various forms of accessible public transportation that are available in our state; provides contact information for New Jersey's Transportation Management Associations (TMA); offers contact information and website addresses of agencies and transit organizations and links to accessible service guides and trip planners. For more information about this resource or to make an appointment for a ride, call 1-866-527-9933. Visit the LogistiCare website for more information and required documentation and forms.